Mashable has compiled screenshots from political campaigns of yesteryear, when Al Gore asked his supporters to subscribe to the “mobile edition” of his site on their PalmPilots. The Clinton/Gore 1996 campaign site features a high-tech background of solid blue and solid red, and an email from Clinton explaining how the internet is “transforming our lives.” Herman Cain’s 1999 website looks like a modern-day sixth-grader’s first encounter with HTML, and in 2002, Mitt Romney’s gubernatorial campaign site featured a kid’s page full of fun facts like his favorite food (meatloaf) and his favorite color (blue). He roots for all the New England teams. Head to Mashable for more campaign screenshots and to explore some of the ancient sites. Oh! 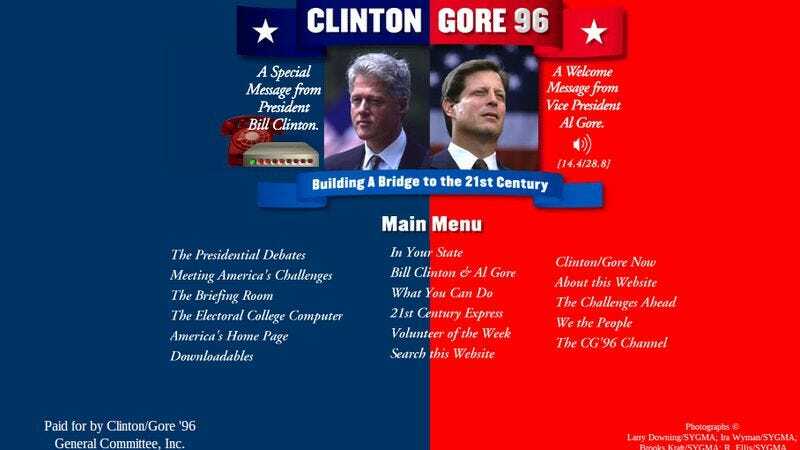 And don’t forget your Clinton/Gore ’96 screensaver.